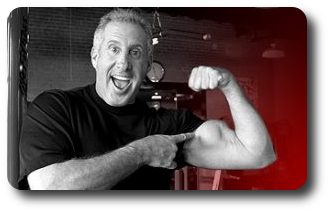 Larry North has been helping people become healthy for over 25 years. He’s done this with three best-selling books, seminars, and gyms. These people were no different than you. The only difference is that they chose to make a change in their life. Now it’s your turn. Don’t put it off any longer. Let Larry help you become an even better you. Here’s Larry North. Larry: Hey everyone. We had a cold front. It went from 105 degrees down to 97. It was really like a cool breeze for everyone in North Texas. This is the Better You show. I’m just thrilled! I’m always seeking to help you in my quest to deliver the best experts, the best guests, the best technology, the best medical advice that you could possibly get; be it exercise or nutrition, and of course your health. My guest is Dr. Neil Riordan, chairman of MedStem out of Panama. There’s so much to talk about. He’s published dozens and dozens of scientific articles, [and] internally peer reviewed journals. He’s just a cutting edge expert when it comes to stem cells. In fact, he and his colleagues have published articles together on MS, spinal cord injuries, heart failure, arthritis, autism. He’s also CEO of Riordan-McKenna Institute right here in Southlake. So he’s local, but he’s actually more international that he is local. Just happens to be close by, consults with numerous universities, and I consider him a friend. You flew in from Wichita, which is where you’re from, right? NR: Yeah, that’s my hometown. We were doing a fund raiser for a young man who has Duchenne’s muscular dystrophy, and originally we started treating him in Panama using stem cells from umbilical cords, and he responded very well, and he responds each time he gets treated, but we have to keep treating him. It’s a very long-term treatment. He has to get new cells every 4-6 months. He is the first person in the US to get umbilical cord stem cells for any indication, and we’re under the FDA. They’ve given us an investigational new drug, compassionate use, because he was treated seven times out of the country, but they gave us the green light for him to get treated in the country. He’s been treated now three years, every four months now, and when he gets those stem cells his breathing goes up, everything improves. In fact, now, eight years later since his first treatment, he’s in better health now than he was at 22, and he’s about 30 and a half. Larry: I’ve been around you long enough and I’ve heard these types of stories, I really hope we can inspire a lot of our listeners. I’d like to start from the beginning. Your father was really kind of a holistic pioneer when it came to better health, was he not? NR: Absolutely. My father and later myself, we did a lot of work on cancer therapy, and what we worked most on was intravenous vitamin C for cancer treatment, decades ago, back when that was really quackery. Now we have universities like Thomas Jefferson starting their third clinical trial using intravenous vitamin C for cancer patients, university of Iowa, even Johns Hopkins has started a study. Some of these ideas take time to catch on, but they’re really catching on now. Larry: What was it like growing up with a father so cutting edge, so way ahead of his time? NR: I think in retrospect now I realize how brave he was in doing the things he was doing. As my brother says, you can recognize a pioneer by the arrows in his back. He certainly had a few, but I think his legacy is that those arrows were unwarranted, and now you have major universities carrying on the research. The quality of life of cancer patients when they get intravenous vitamin C has improved. It’s been proven. More and more literature comes out, and he’s being vindicated. Larry: What I’ve found, and this is why I’m so excited to have you, what I’ve found is that I know just enough about stem cells to really be dangerous when I try to educate people, and I don’t. Most people really have no clue. They’ve heard of stem cells. They think they know a little bit about it, but they’re really not sure. They’ll just be inquisitive. Where did all the stem cell research start? NR: It actually started with one of our other research projects alongside the vitamin C research at the Riordan Clinic in Wichita, where we were looking at host non-toxic therapies for cancer. One of them…, there are cells in your body called dendritic cells. They are commanders of the immune system. They tell the immune system what to do, and in cancer patients they’re being blocked. One way to overcome that blockade to the immune system is by enhancing these dendritic cells and harvesting white blood cells to convert to dendritic cells. That was late 80s, and I left in the 90s to start my own clinic to actually make dendritic cells, to make cancer-therapeutic vaccines for cancer patients. I was in the Riordan Clinic for fourteen years, working on intravenous vitamin C and dendritic cell vaccines. Larry: Interesting. What are the most common types of stem cells people have available to them today? I want to talk about that, and also, why umbilical? From what I’ve read, if you want stem cells that’s where you want to go, but I understand there are other options. You were able to treat this young man locally, but most people have to go out of the country. What were the early stages of stem cell options for people and where has it evolved to? NR: First I want to exclude embryonic and fetal stem cells, which are subject to a lot of debate–religious and ethical–and we want to exclude that because that’s not even part of our conversation. It’s from an ethical and scientific standpoint that we’ve never utilized or even studied embryonic or fetal stem cells. We only use what’s classified as adult stem cells, and what’s included in that, is after a full-term healthy birth, we call those post-natal or adult stem cells. Once a healthy, normal life has begun on until your demise, those are all considered adult stem cells, and we can separate those into two major categories: one is blood-forming stem cells that are formed in your bone marrow, and those are called hematopoetic stem cells or blood-forming cells because that’s what they do. There’s a lot of confusion these days about those cells being used to treat cancer or MS, but those cells don’t really treat anything. When you hear about a cancer patient being treated with stem cells, they’re actually being treated with chemotherapy and/or radiation, in the hope that they get a high enough dose to kill the cancer, but it also kills your bone marrow’s ability to produce blood cells, so you die of an infection or you die of bleeding or something like that. The stem cells in that world are a rescue, not a treatment. Your stem cells are gone. They’ve all been obliterated, so you need new stem cells and start making all these blood products again. The world we’re in are repair stem cells -the repair stem cells are found throughout your body called MSCs. We use the term MSC for mesenchymal stem cells. We have them throughout our body and as we age, they become fewer in number, and as we age they lose their ability to fix things. They become less robust. So you have them in your fat, your bone marrow, every organ in your body. The healthiest, most robust stem cells from a non-dangerous, non-controversial source are from the umbilical cord. If we look at the potency of umbilical cord MSCs compared to mine, I’m 57 years old, my cells are going to divide once every 50-60 hours, whereas the umbilical cord cells divide every 24 hours, which doesn’t sound like a lot, until you look at the numbers. One cell after 30 days you’re going to have a billion cells from one if they divide every 24 hours. If you look at my cells in a lab, I’ll have a pitiful 2-300 cells after that period of time. It’s not just the cells, but it’s also what the cells secrete, molecules that stimulate regeneration. Our cells because we’re over the age of 50, they do not produce as many of those factors that stimulate regeneration, they’re also less robust their capacity to modulate the immune system and decrease inflammation. We all know that inflammation is the real key to aging. Larry: You’ve touched on a lot of things. You are so brilliant and so smart. You’re a scientist. One of the great things about having you, is that this is the future of medicine, and being able to explain to people how they work. I want more stories from people who are actually, truly changing their lives as the result of stem cells, but I also want to talk to you about the confusions. I’ve had some friends who have gone to Houston and had some body fat taken out of their body, processed, and what are the benefits of that vs. umbilical? We’ll come back and talk about that. [Commercial break] We’re talking about the umbilical stem cells. Let’s say someone lives in Dallas. How would they know if they’re a candidate for stem cells? Larry: So let’s say they go to the site, and one of my sponsors here is BioMedical and they’re about hormone optimization, and I love that your clinic actually does BioT. So if you’re thirty, and you test your testosterone levels and it’s high, let’s say above 800, they’d tell you you’re not a candidate for it. What tells you about who needs stem cells? NR: We have a number of protocols. One of the things we do most of is we treat autoimmune diseases, and one of the indications we have is multiple sclerosis, rheumatoid arthritis and others. The cells are very good when you infuse them in the vein. They change the auto-immune environment in the body. If someone wants to explore it as a treatment option, they’d go to the site and read about what we do and fill out an application. We have six MDs that work at the Stem Cell Institute in Panama. They review every case and will call them and typically ask them for medical records. 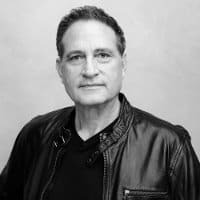 Larry: I’ve been there, to Panama, visited and got to work with your medical professionals, and I found it an amazing experience because for me, it was orthopedic because of the fact that I was a body-builder back in the 70s and 80s and we did things back then we probably shouldn’t have done. We sort of didn’t know any better. After being in several auto accidents, my neck, my back, my knee, and I have to tell you I had stem cells directly into the knee, and prior to meeting you I thought I was going to have to have surgery. In the month or so since we last saw each other, I don’t know what’s going on in my body but I’m feeling amazing. I want more of that! For me it was orthopedic. For others listening, you talked about inflammation, and stem cells are definitely able to help with that. NR: Absolutely. They’re producers of the anti-inflammatory molecules in your body, the producers of your natural ibuprophen or naproxine. A lot of people, if they have a lot of arthritis, that’s another one of our protocols. Osteoarthritis, they don’t need to take those things anymore. We can inject right into the joint as well as do intravenous [injections]. The cells have this capacity to home to inflamed areas and respond to the situation to make the appropriate antibodies. Said: I am 60 years old and have been diagnosed with diabetes for six years. My A1C average is about 7-7.2. My question is, is there any research on diabetes and diabetic people? Will what you do help me? NR: We don’t treat Type 2 diabetes in Panama, but there was a very good study done by the University of Miami, and they used bone marrow stem cells from the patient themselves, isolated the stem cells and pushed the stem cells into the pancreas, and if I remember correctly got a reduction in hemogloben A1C of 2.5 points was the mean for 20-some patients. I can post that study to my blog for you. Said: Did that study proceed further? NR: That was a one-time study and they followed the patients for a year. The procedure itself took one day, the bone marrow harvest, concentrating, and then the injection. Said: What I have read, all these pharmaceutical companies are making money, tons of money, so naturally they don’t want anyone to promote to cure this disease. I’m sure there is a cure but no one wants to do the research. Larry: Also, with Type 2, you do want to exercise, eat right, have your hormones in balance, take good care of yourself. That’s one of the best ways you can deal with your overall health and wellness, which you do control. Good luck to you. Neil, so, help me out here. Stem cells is a hot topic right now but you’ve been doing this for decades. You’ve devoted your life to it. I’ve seen and I’ve read on social media that locally, people are offering stem cells you can get locally. But really, without that special dispensation you have for one patient, what are people doing that are saying they can get it from a local clinic here. NR: In our case at RMI in Southlake, we do stem cell therapy but we’re limited by FDA to using the patient’s own bone marrow. We also use amnion from afterbirth that has growth factors to make your bone marrow perform younger. We’ve got Dr. Wade McKenna, our board certified orthopedic surgeon. He does treatments using the patient’s own bone marrow in a relatively painless extraction procedure. He uses that in combination with amnion and with surgery. In his words, he likes to take big surgeries and make them small surgeries, and small surgeries and make them injections. Larry: It’s a relatively new clinic but he’s busy, right? NR: Yep, he’s done thousands of surgeries using bone marrow in Decatur and now he’s here, only for orthopedics, but we have another doctor there for overall wellness and optimization and hormone replacement therapies. Larry: What led you to umbilical stem cells over other forms of stem cell treatment? NR: It was mainly the science. One of the misconceptions is that the cells actually become new tissue. We have people come to us asking for new bladders and new body parts. These cells do not do that. These cells do home to places of inflammation in your body. That’s the sweet spot for these MSCs and they secrete substances that turn off these inflammations, and another sweet spot is autoimmune disease. If you look at what they secrete and their activity on the immune system and compare that to fat stem cells, you can get MSCs from your own fat, if you compare that, you have way more modulation potency from the umbilical cord than you do from your fat. NR: Basically you have to get this rock over a hill from an immune standpoint, and you can get halfway up the hill and it doesn’t do any good. If you want to get the rock over the hill, the best way to do it is with the best cells that produce the right molecules that stimulate your immune system to normalize. Larry: The science agrees with you, there’s no question, but in the early stages, where did you go to get the cells in the first place? NR: In Southlake, we have specialized equipment that allows us to take out the bone marrow, and we also have the amnion product that “hops up” the bone marrow. In Panama, we have a 16,000 square foot laboratory where we isolate the stem cells from umbilical cells, grow them out, freeze them down, and then we thaw them as required for use. All the hard work in Panama is in the laboratory because the actual therapy is nothing more, as you know. Larry: Now, are there a lot of labs in the world that produce those types of cells? NR: There’s about a handful. We’re creating a wedge with this Duchenne’s, and we’re creating a wedge for larger studies with more individuals. Larry: Our callers touched upon it a little bit with pharma, I imagine there’s a lot of red tape and lobbying and I imagine pharma’s a lot of the pushback on why you’re not able to have your labs all over the United States. NR: If you take rheumatoid arthritis as an example, and there was a study that came out where they treated over 172 people with umbilical MSCs, and all of them improved, after one infusion. Larry: This is huge for those patients, because it’s very painful and there’s no cure before stem cells. NR: If you look at the drugs that you hear about all the time watching television, you see these anti-rheumatic drugs over and over again, and they represent a 14 billion dollar industry in the US. So if you have a competitor that’s not yet FDA approved, there’s not going to be a great deal of pharma support for that. Larry: Am I wrong in believe that the future is here, stem cells are going to be much bigger in peoples’ lives than they ever imagined? NR: Yeah, I think it’s definitely right up there with vaccinations and antibiotics as far as the next leap forward in medicine, and as congressman Joe Barton pointed out in a meeting we had a couple of months ago, the truth always comes out. 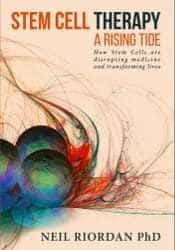 Sometimes it takes longer, and in this case the effectiveness of these cells, the safety of these cells, the naturalness of these cells, all those truths will become self evident at some point. How long it takes, I don’t know. There are other countries investing and building a regulatory process that will speed things up. For example, Japan has put in rules and regulations that will speed things up. Germany, South Korea, and Taiwan are right behind Japan. They’re going to allow for innovation like we’ve never seen before. If we don’t do something in this country, we’re going to be left in the dust. So, Japan’s rule basically states that once you prove the safety of your product, it can go to market for seven years, and in that seven years you can demonstrate what it’s effective for. I think we need something like that in this country if we’re going to stay competitive. There’s a bill being revised right now called the Renew Act. I don’t know that that’s going to make it, but we need something like it or for one of the states to create a statute much like medical marijuana, where the state of Colorado has said in spite of federal regulations we’re going to allow this and the attorney general’s going to back us up. I think Texas has a pretty good chance of that. I just got back from Kansas, and they’ve got a pretty good chance too. Larry: Partly because of you! You’re at the forefront pushing and lobbying and really trying to create awareness. NR: If you look at the economic benefit, I hate to use marijuana as a comparative, but if you look at the economics in Colorado, the state coffers are swollen with cash, and I think that would happen if a state were to say to the federal government, this is what we’re going to do. There’s enough evidence of safety, certainly with the patient’s own stem cells, with the post-natal stem cells, there’s enough safety data that one state will stand up, or the federal government’s going to have to make a break. 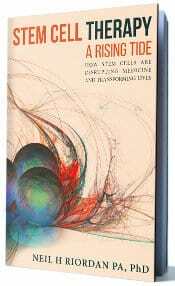 NR: I think the best resource is www.cellmedicine.com and RMIclinic.com. It tells you everything we do and don’t do. BIXBY, Okla. – A Bixby family has new hope for their three- year-old son with cerebral palsy. Easton Wallace went to Panama last year to receive stem cell therapy. Unfortunately, the therapy is not FDA-approved in the United States. The Wallace family held everything from spaghetti dinners to golf tournaments to raise the money for their son’s first treatment. His mother believes it was worth it. She says Easton is learning to talk and gain upper body strength. That is why she is hoping to raise enough money for a second treatment. “He’s the happiest little boy ever. He can make anyone smile. He’s always smiling,” says Cassie Wallace. Easton Wallace is a typical toddler. He loves playing outdoors and spending time with family. But unlike most other kids, Easton is living with spastic quadriplegic cerebral palsy, which affects every aspect of his life. It’s hard for Cassie to watch her son struggle. 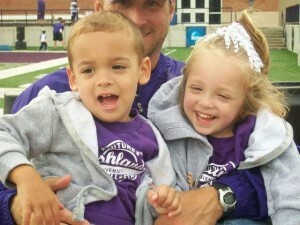 But she says Easton’s infectious smile and loving personality give her strength. Cassie says a big part of giving Easton the best life possible, is taking him to Panama to receive Stem Cell therapy. She says the $20,000 treatment is not covered by insurance. Cassie showed 2 Works for You video of Easton pushing himself in a device called a “pacer” for the very first time. She says this was a big day for their family because they never know for sure what milestones their child will get to experience. That’s why she and her family are trying to raise enough money to cover the expenses for another trip to Panama in December of this year. The family is organizing another golf tournament in Sapulpa on August 29 at Clary Fields Golf Club. The event is called the “Easton Open.” There is still time to sign up by calling 918-248-4080. You can also donate directly to the cause by logging on to Easton’s give forward page here. Colton is planning on coming to Panama for follow-up treatment later this year. Here is a video of him walking from June 2015. And here was Colton in 2014 about one year prior to the video above. This video was taken a year after his first treatments in 2013. Sarah Washington and her daughter Mary. Mary is 2 years old and was diagnosed with cerebral palsy when she was 4 months old. She was first treated at the Stem Cell Institute in Panama using human umbilical cord-derived stem cells. Mary received these stem cells intravenously over the course of 4 days. Her first treatment was in September of 2012. This interview was recorded in March 2013 at the clinic while she was there for a second round of treatments. What kind of improvements have you noticed? Overall, in general, what we noticed was, her upper body, she’s very stiff. She’s spastic in her legs and her arms and she has low tone in her trunk. In her upper body, we noticed a pretty significant improvement. Her range of motion, she couldn’t lift her arms over her before and now she can do that on both sides easily. And her hands, she was in tight little fists most of the time, whereas now if she is in a fist it’s very loose. But most of the time she kind of has her hands relaxed. That was a big improvement for us; small but significant for our family. Her vision has improved, not necessarily distance but as far as like what I think as seeing details. So she would be able to tell the difference between you and me if we didn’t say anything. Whereas before, I don’t think she could do that. She would rely on smell and hearing more than her vision. Now she uses her vision a lot more. So that’s been an improvement that we’ve seen. She is more involved in the world around her. [She] wants to be more involved in the world around her so that’s good. She has definitely, she doesn’t say, “mama, dada, ba, ba” yet but she definitely is making more vocalizations, making more sounds and trying to experiment with her voice, which is a positive thing. She is trying different ways of communicating versus just screaming which is what she did before because that is all she knew how to do. And now, she is kind of fussing or sometimes she’ll just kind of like, yell and stop and wait for me to answer her instead of just going from “zero” to “scream”. So her communication has improved as well. One thing that we were not expecting that we were pleased about is an improvement in her seizures. That wasn’t even something that we had even, I don’t know. I guess it just didn’t occur to us that maybe this would be helpful with that but before we came the first time in September she had been sick and we actually had to delay our trip twice because she had bronchialitis. She was just having a really hard time. And she was having a lot of seizures. We had to add a new seizure medicine to try to get them under control and she was having 6 or 7 short myotonic jerks every day. The first time we were here, by about Thursday, which was like day three of treatment, of stem cells we noticed that she hadn’t had a seizure that day. Whereas before, she was having 6 or 7 a day. And so, that was one thing. It was surprising but it was a nice surprise that those have improved since we’ve been here. She will still have breakthrough seizures every now and then when she’s sick, teething but she, we haven’t gone back to that, where she was having them on a regular basis. So that’s good. That’s been a good improvement. Since we’ve been here this time, I haven’t really seen anything where I could say, “Oh, I think that’s the stem cells.” yet but I do know that last time it did take a couple of weeks for us to notice, you know, or to really pinpoint and say, “Yes, we think that is the stem cells. There’s no way she could have done that before.” So, and all of our therapists agree that her range of motion and her upper body for sure, and her vision would not have been the way they were without coming here. 1. Exploring Stem Cell Therapy for Cerebral Palsy: This is how we came to our decision and provides lots of background research as to why we started down this path. 2. Panama City – Hudsyn’s Big Adventure: A recap of our trip and all that we experienced while there. 4. Happy 2nd Birthday Miss H! : I wrote a letter to Hudsyn on her birthday…and near the end are a few other updates. 1. Extreme Seizure Reduction: While we had nearly a week of zero seizures (huge leap from the 6-10 she was averaging before stem cells), she broke her record and has averaged 1-2 per day since that week in November. But we’re so much more hopeful that between her Keto Diet and the stem cells, we’ve got things under control…finally. It makes me teary to fully embrace this accomplishment because two years ago, we were watching our little girl have 40-50 a DAY, rendering us helpless as her brain became severely affected by them. Even medications had failed to help her. And now…to for a moment think that we might have a future without seizures is, well, just amazing…a miracle. Praise God! 2. Physical Therapy/Occupational Therapy: I attended one of Hudsyn’s therapy sessions at RIKC Friday, Dec. 7. She bore weight on all fours (with the help of arm braces of course) for over 8 minutes without complaint…a new record! We really enjoy our relationship with the team of therapists at RIKC. Erin (her OT) and April (her speech therapist) adore Miss H….and both are often caught between appointments coming to talk to or hold Hudsyn before it’s her time to work with each of them. We hope we will be able to continue her regular sessions here throughout this year. It truly is one of the best, most prominent therapy centers we’ve worked with thus far. 3. Increase in Responsiveness & Smiling: This is the fun one. I can’t tell you how much joy it brings to see her interacting with more people now. We’d see this every so often (maybe once a day) before stem cells. Now…it’s on demand. If you talk, hold, sing, read, etc to Miss H…you’ll likely get a big smile or some type of physical response from her. There’s a big personality inside that little body…and we are completely in love with it. 4. Social Interaction: Hudsyn continues to enjoy preschool at CCVI. She participated in her first school Christmas program last month. I must admit, I was pretty emotional watching the event. Not only was the setup and organization behind something like this incredible, but I realized deep down that I didn’t think I’d ever get to be in the audience watching my 2 year-old daughter shake jingle bells and be on stage with all the other kids in preschool. I had really come to a place where I’d accepted that she wasn’t going to be normal…that she wouldn’t be able to give us the joy of watching a holiday music program. But there she was, sitting on one of her therapist’s lap while thrusting her whole upper body forward, working hard to shake her bells as everyone sang the familiar songs. Yeah, I bawled like a baby. I’m sure the folks sitting next to me understood – either they wrote me off as a 9-month pregnant woman being emotional or they were teary right along with me. There were several wet faces in the audience that night. It was a wonderful holiday gift from our little girl. And, after the program, Hudsyn got to meet Santa for the first time! Her frequent vomiting is back. But we really believe this is a result of the winter weather, thus contributing to some nasal mucous that is building up in the back of her throat and causing her to gag/vomit during key times of the day. These times are usually in the morning and then again in the evening. The vomiting isn’t the same as it was before, though. It’s not projectile, but instead a real puke…like you and I would do if our stomach was upset or we had something caught in our throat. She gives warning signals before doing it, so that’s been helpful in getting her to the bathroom sink on many occasions. Another thought Dan had was these scheduled pukes are happening about 30-45 minutes after we give her meds. You can time it almost exactly every morning and evening. We discussed this with Dr. A (her neurologist) last week at her regular Keto Diet follow up appointment. Dan wondered if maybe the meds are causing this reaction whereas before her brain was more in need of them than after stem cells. So we were hoping to begin eliminating this drug, especially since the sharp decline in her seizures. Keppra in particular causes dizziness and nauseousness as side effects – even in small doses. Dr. A agreed to begin slowly weaning her off Keppra and we’re happy to report that in one short month, she will be rid of it and all its side effects. We’ve also eliminated her Citicholine as it had some similar side effects and we weren’t seeing much benefit to this supplement any longer. Treating the mucous is a bit harder. She can’t have regular expectorants or decongestants like you and I because of the Keto Diet. So, we’ve upped her water intake significantly which will hopefully help to thin it out. I’m glad we did it when we did because the next few days after her neuro appointment were awful. Miss H contracted the flu and a nasty cough coupled with a 102 degree fever. Tis the season! Thankfully, this time we were able to avoid being inpatient, mainly because of her G-tube and that we could force water, food and meds in her without putting them in her mouth. Without it, she would’ve been in the hospital. This time last year we were fretting about whether to do the G-tube surgery or not…and now…we don’t regret it one bit. Miss H is still battling the cold/cough, but we’re happy to report her fever broke and the vomiting has decreased enough that she’s on full feeds again. While most parents would complain or be annoyed by this behavior, we’re THRILLED. This is just more of her personality and desire coming out to communicate with us…and we couldn’t be happier as a result. We’re now over halfway into our post-stem cell therapy journey with this being month 4 of 6. After six months from her first visit, Miss H is eligible to go back to Panama for another round of stem cell IV injections. Many of her fans, like you, have wondered if we’re planning to go again. We’ve been discussing this extensively with Dr. A, who has several other patients curious about the treatment. In addition to sending him journal articles and published academic studies from the Panama doctors we’ve showed him several of Hudsyn’s videos, her seizure tracking chart (above) and how she responds to our voices with smiling and interaction. He’s been amazed at her progress and obviously is very pleased. His only question is whether these improvements are a result of the stem cells or of normal development she would’ve had anyway. This exact question is the primary point of the clinical phase II trial Duke University is doing right now. As her parents, we have to force ourselves to look at this objectively. Because in our heart of hearts, and after everything we’ve been through as a family…and everything Hudsyn has had to endure medically, we really just want this to work. With that perspective in mind, we’d love nothing more than to be able to say that umbilical cord blood stem cells are a “cure.” But we feel strongly that the science needs more research and development before we’re to that claim. We will, however, say with the below evidence, Miss H would’ve never seen this kind of development in such a short period of time without stem cells. Her field of vision went from 20% to 100% in less than 3 weeks. Seizures became nearly non-existent after two months. As a result, anti-seizure medications (and all their “fun” side effects) are being discontinued. Vocalization, eye contact and general responsiveness improved significantly within 1 month. PT, OT, Speech and vision therapists documented large enough gains during her 3-month therapy visits that they claim are “remarkable” for a child with Hudsyn’s brain injury. With no other changes to her treatment, we must look at stem cells as helping with these gains. To say that stem cells are a complete cure is false. But to say they have improved her quality of life is certainly true. We believe the combination of intense PT, OT, speech and vision therapy (with stem cells being at the primary level of the treatment plan) have not only helped Miss H repair some of her original brain damage, we know they’re allowing her to make exponential leaps in shorter periods of time. Will we go to Panama again? We can faithfully and loudly declare: Hell yes. ASHLAND — Three-year-old twins with cerebral palsy are making life adventurous, challenging and bittersweet for the Hancock family. Because they were born 10 weeks premature, both children suffered developmental delays. By the time Tessa and Dylan were 20 months old, Tessa had been diagnosed with cerebral palsy, a permanent disorder that affects movement and posture. At that time, parents Carrie and Jeremy were getting ready to take their daughter overseas for a stem cell transplant, a procedure that would allow Tessa to live a better, less physically restricted life. In the midst of their planning, the family was soon faced with another obstacle. That January, Dylan also was diagnosed with cerebral palsy. “What do you do? They’re your babies. You just go with it and do what you think is best,” Carrie said. “Before, we were always told that he just had developmental delays, but as much as you hated to hear it, it was almost a blessing because we were paying out of pocket for him because he hadn’t been officially diagnosed. The Ashland family ended up taking Tessa to Panama City, Panama, where she had her first round of stem cell treatments in 2009. Today the twins attend therapy sessions at MedCentral Pediatric Therapy one day a week and preschool at Tri-County Preschool four days a week. They receive occupational, speech and physical therapy. The family takes the twins on outings by stroller and enjoy their play time together, but each day can be daunting. “The biggest difference is the physical challenge of dressing and feeding. Tessa is in the process of being potty trained, but Dylan doesn’t want to yet,” Carrie said. “She can’t feed herself and we’re still changing diapers at age 3. Recently, Dan and Stephanie Kreisher, of Ontario, held their third fundraiser for the family. Jeremy was on Dan’s 1994 state championship baseball team at Ontario High School. The Kreishers and friends raised $1,400 for the Hancocks, along with providing them two iPads for Tessa and Dylan after learning the electronics would help their communication skills. The iPads were sponsored by Elite Excavating and Zara Construction. “I can’t say enough about Dan and Stephanie. The iPads are huge for us. We’re in the process of getting different communication devices to help with fine motor skills,” Carrie said. “They use them in school and it’s nice to be able to incorporate what they’re learning at home. Life isn’t easy, but we are very blessed. Sarai Nathan suffers from mild spastic quadriplegic cerebral palsy. She came to the Stem Cell Institute at the beginning of August 2011 when she was about 16 months old. The following is a transcription of a phone call interview with Sarai’s mother, Elisabeth. It took place on January 18, 2012 about 5 1/2 months after her stem cell procedures. How is Sarai doing since receiving stem cell therapy five months ago? She’s walking with very, very little support. Ever since we got the stem cell transplant, there’s been tons of progress. The major thing that I relay to people is that the stem cell treatment kind of put the cells in place to rebuild everything. We flew right from the stem cell treatment to a place called the Napa Center and did a three-week intensive [physical therapy] program four hours per day and she was a completely different person four weeks later. Once the stem cells migrated and rebuilt, all-of-the-sudden she was able to able to do all these things crazy quickly. It was unbelievable. She went from not being able to sit to sitting, standing cruising furniture by herself; without any assistance at all and she couldn’t even lift up her trunk prior to coming to Panama. Out of 100% being fully recovered, I would say she has had an 85% recovery since before the stem cells. I know that the stem cells kind of laid the groundwork for that progress to be made but I definitely believe that doing the intensive right after the stem cells sealed the deal. I don’t think it was just the stem cells. I think that doing one right after the other made the progress amazing. 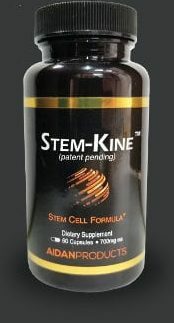 Did you try any other kinds of treatments before stem cells? We tried hyperbaric [oxygen treatments] which worked but I noticed that the results regressed a little bit after a few months. It would make her spasticity better and then little by little I’d notice it start to come back 3 -5 months later. The whole thing was very expensive and time consuming though. How did you find out about the Stem Cell Institute? I am really active on a lot of Yahoo groups and I read about the parents who had positive results with stem cells and many had good experiences with the Stem Cell Institute. So I called them and they were really on top of getting back to me and answering all of my questions. And my dad, who has a background in law enforcement, had it checked out as well because he said that he wouldn’t pay some crooks to inject my kid at some random place in Panama. After everything checked out, he helped me pay for it. And I am so glad that we got to do it. What is your opinion of the doctors and medical staff at the clinic? We tell people all the time that it was the best medical care we’ve ever received since our daughter was born. The hospitals, doctors, they were all far superior in patient care. They were prompt, professional, loving and they still check in with us all the time. And the IV, I’ve never seen someone nail an IV that quickly. Randy Bowen [MD], who did all of her IV injections was just so good. My daughter had a huge crush on him and on the second day, actually started handing him her arm. Instead of crying when she was about to get an injection, she would look a little scared and just hand him her arm like, “Alright, just get it over with.” She was only 16 months old so it wasn’t like she could talk or anything. What do her doctors and therapists at home think? He was asking me about all the information for the clinic; everyone’s name and number. He also said, “I would have tried to talk you out of it so I am so glad you didn’t tell me. What happened to your child is unbelievable and it makes me want to fight and advocate for stem cells.” He’s been specializing in neuro-developmental delays for a long time and said that he would everything he could for the rest of his life to advocate for this therapy. And they asked me, of course, where we went. The biggest thing we’ve noticed is her ability to track people and her vision. Her cognitive skills have improved. Before her stem cell treatment 7 months ago, she was like a 50 watt light bulb and she is like a 200 watts in comparison. She reacts more, holds her head up more and her hands are nice and open now, not fisted like before. Hand to mouth motion is much easier for her to do. Her range of motion, in general, is much better. She can now raise her hands over her head and she was never able to do that before. Her therapists have seen dramatic changes. Our family has noticed changes. The neurologist has noticed changes. We are very thankful that we were able to get this treatment for her in Panama. We couldn’t imagine her not being who she is now. She is 200 times better than what she was. cord blood transplant Dylan had a "miraculous" recovery according to parents. bit, and his vocabulary has expanded amazingly." teacher and therapists at the school he attends, as well as his doctors." never seen a child make such gains in her 20 years of teaching. actually impact cerebral palsy. Dr. James E Carroll, (706) 721-3371, of The Medical College of Georgia has recently announced initiation of a 40 patient placebo controlled trial in patients with cerebral palsy between 2-12. For more information please see the link below.